Comment: With this text the preacher must walk the line, avoiding a situation where we blame victims for their suffering, yet holding the community accountable for their participation in the systemic sin that so often leads to the destruction of God’s good creation. Perhaps a good place to start is with the phrase “They are skilled at doing evil, but do not know how to do good.” In Silent Music we find a connection to this struggle within human beings. Ali connects his calligraphy to life, how easily his pen write the word war, how stubbornly it resists the word peace. In the midst of living in war-torn Baghdad, Ali will practice writing peace until it flows freely from his pen. Invite your congregation to share their own experience of the inner struggle between doing evil and good. Comment: In sharing the stories of the lost sheep and coin, Jesus invites listeners into the experience of searching. Who among you hasn’t had an experience of searching for something you value when it is lost? Spot, the Cat invites children to connect with the act of searching. 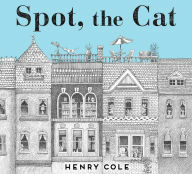 Readers join the boy in searching for Spot as they seek to find the cat on each detailed page. Searching for someone who is lost can be difficult, but it is done out of love. If we like Spot, stray from home, Jesus will seek us because he loves us. Using this text and story, invite the children of your church to share their own experiences of seeking lost things as well as the experience of being lost and found. The Lectionary Links this week are written by Union Presbyterian Alumna and regular contributor Noell Rathbun-Cook. Lectionary Links (RCL): September 11, 2016 by Storypath is licensed under a Creative Commons Attribution-NonCommercial 4.0 International License.